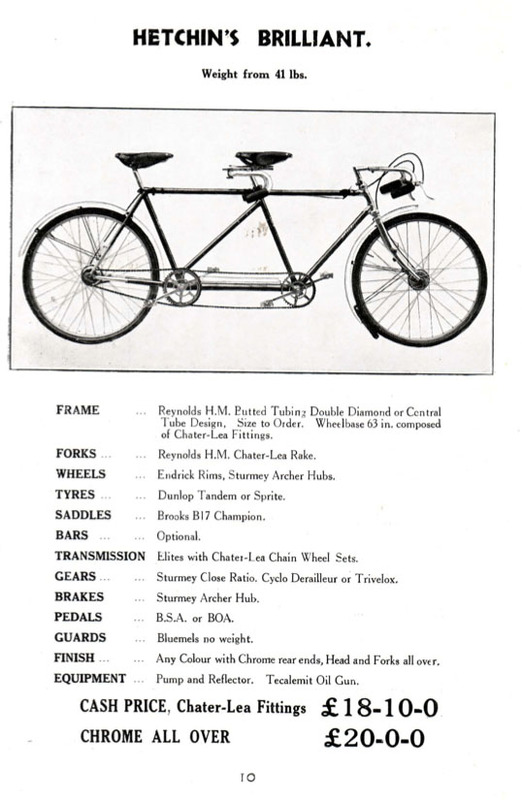 Bicycle companies faced a historical deletion around the time World War II hit as the prevalence of automobiles and weight of war became overwhelming. Manufacturers, racers and race organizers found their livelihoods interrupted – and in some unfortunate cases, even ended. It was around this time that several European bicycle companies found themselves struggling through economic hardships and societal fears that hindered sales or rendered them altogether impossible. Perhaps this is why vintage bicycles from that era have become so coveted: if they stuck around through those hardest of times, they had to have been of the highest quality. North London’s Hetchins bicycles certainly fell into this category and one look at their interesting frame designs, diverse model range and meticulous lug work is enough to make even the casual observer understand why. It’s rare to find a bicycle company founder who wasn’t, at one time, a racer, pro mechanic or the like. But Hyman Hetchin was none of these things. He was simply a bicycle enthusiast who took his hobby to the next level. Originally a gramophone dealer, the Russian-born Hetchin applied successfully for British citizenship after fleeing the revolution at age 26 with his sisters (his parents were killed in the uprising), and began to sell bicycles as a seasonal supplement out of his home. But the bicycle end of his business grew rapidly and he acquired the building next door to house both the gramophone shop and bicycle shop. 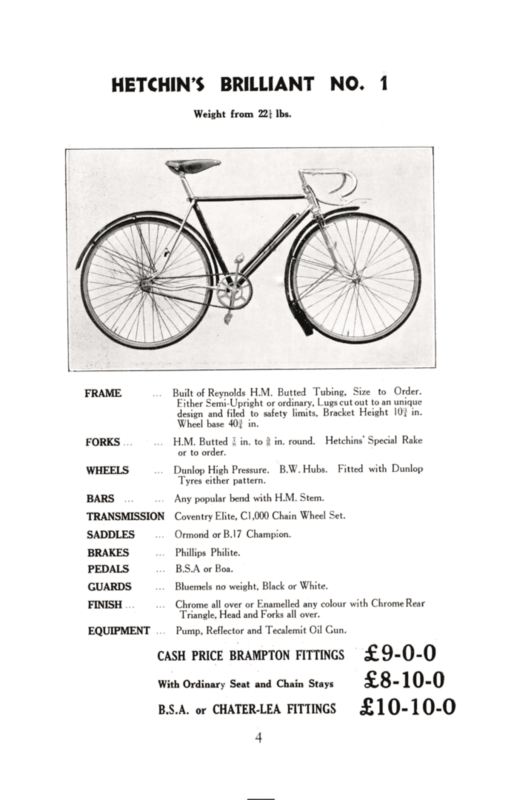 Initially, Hetchin sold BSA, Raleigh, Hercules, Rudge and Humber bicycles. It wasn’t until a few years later that he started peddling bicycles bearing his own name, which were made by various local frame builders. 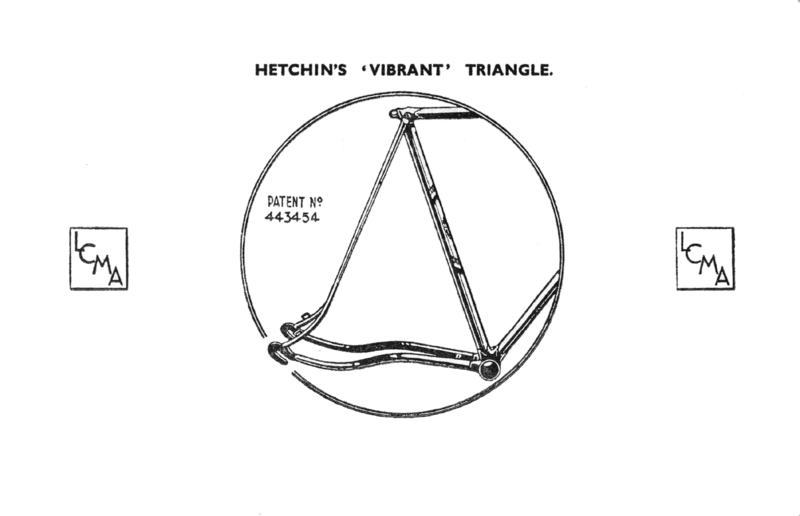 One of those frame builders – Jack Denny – came to Hetchin with a design that not only changed his business, but also changed bicycle design in general. Denny had designed a frame with what eventually became known as a Vibrant Triangle, a curled-tube design that gave the seat stays and chain stays of Denny’s frame a very characteristic appearance and ride quality. 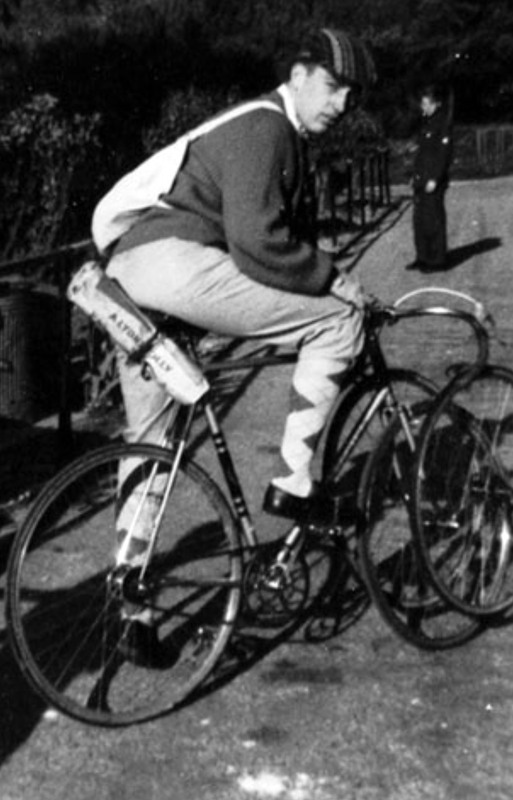 Motivated by the severe accidents his fellow cyclists had suffered due to frame breakage, Denny began tinkering with designs that could both improve strength and dampen vibration. The Vibrant Triangle achieved both of these goals successfully. 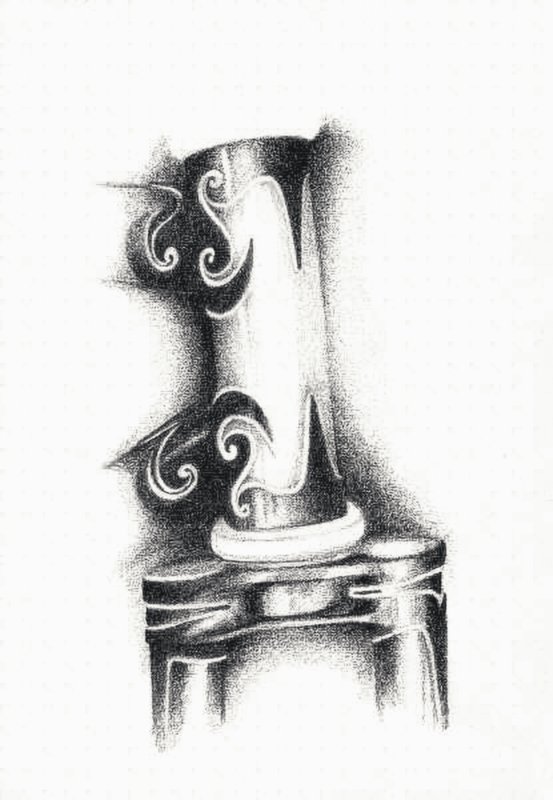 Hetchin was so taken with the design that he patented it and became partners with Denny. 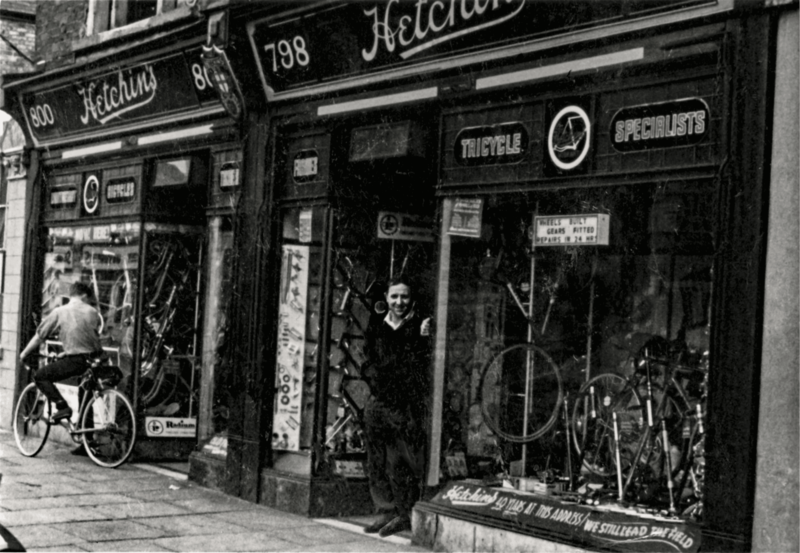 In 1934, Hetchin moved the location of his shop and opened for business selling cycles exclusively. While not certain, Denny most likely managed the shop on-site. Nationwide enthusiasm for cycling was high and Hetchin was determined to take advantage of it and make a name for himself. After the shop itself had relocated one more time, the patent cleared for the Vibrant Triangle and production began on frames featuring this design in 1935. It was met with immediate success, receiving stellar reviews in magazines and hitting the market full force with three models: Brilliant No.1, Brilliant No. 2 and Superbe. All models at that time featured Reynolds A tubing, until later production runs used Reynolds 531 tubing. 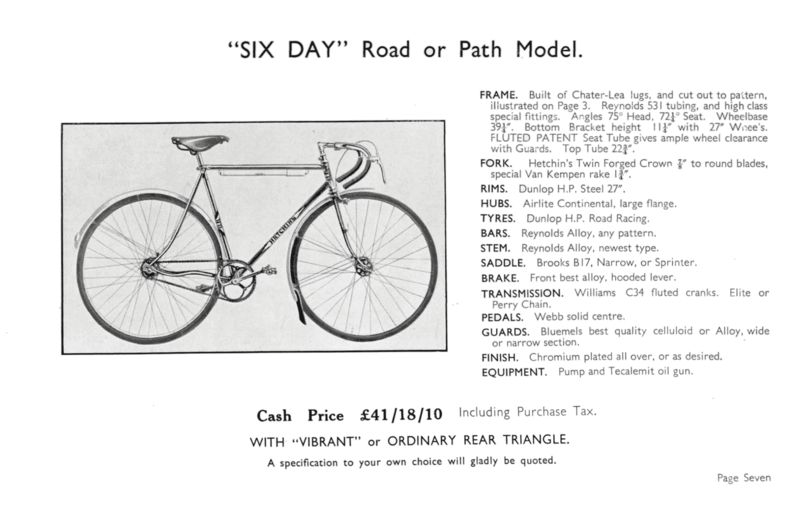 Hetchin’s initial catalog offered straight-stay frame models as well, so with a strong line of bicycles, Hetchin took his product to the public. Why was the Vibrant Triangle so successful? In the time of racing before (and certainly for years after) World War II, road conditions in Europe and elsewhere were atrocious. Riding rutted, potholed roads on wooden rims bolted to stiff frames was a challenge all by itself and racers looked for every edge they could find on the race course. 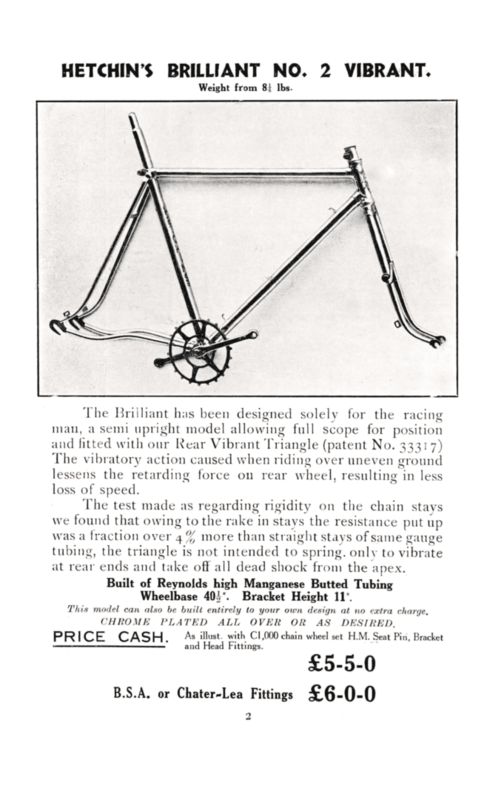 The Vibrant Triangle allowed for slight flex to dampen some of the road shock otherwise transferred to the rest of the frame and then rider, thereby eliminating speed loss and enhancing comfort. 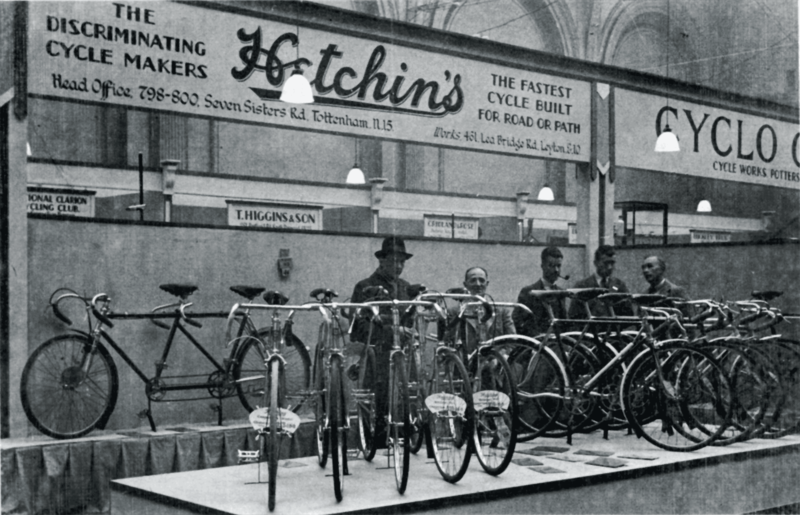 Hetchins bicycles made their way onto the pro circuit shortly after their public introduction. 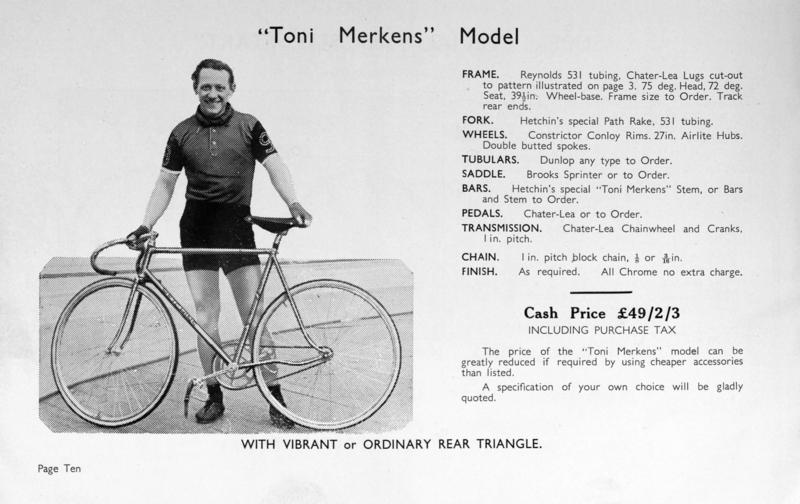 They carried podium racers at both the 1936 World’s and the 1936 Olympic Championships, and popular cyclist Tony Merkens rode a Hetchins as his bike of choice for such victories as the UK’s Herne Hill that year. By 1937, the cycling facet of Hetchin’s business had taken over fully and he decided to drop the music side of his parallel ventures. And commit to cycling he did. 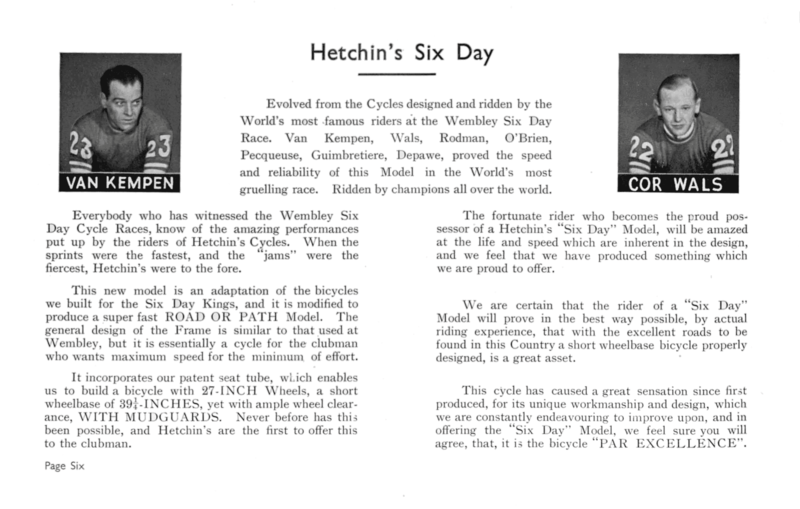 In that same year, Merkens rode a Hetchins in the Wembly Six-Day race and though he did not win, he performed well and gave Hetchins bicycles a well-deserved spotlight. Hetchin made the most of it, pushing his product as well as his racer after the strong finish. Related advertising efforts paid off the following year: nine riders rode Hetchins bicycles in the same race, providing even more exposure and certainly more profit for the still-fledgling business. With Denny by his side, Hetchin continued adding dimension and depth to his bicycle line by pursuing various innovations — some successful, others ill-fated. 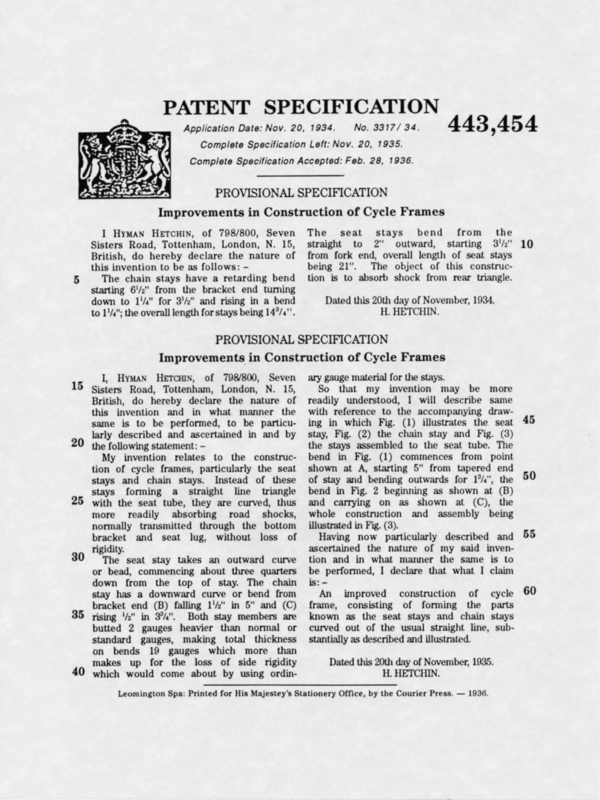 The company’s foray into tandem bicycles, for example, never made much headway as far as sales, but it led to a patent application for a fluted seat tube, which Hetchin failed to pursue further after the initial application and was therefore dropped by the patent office. 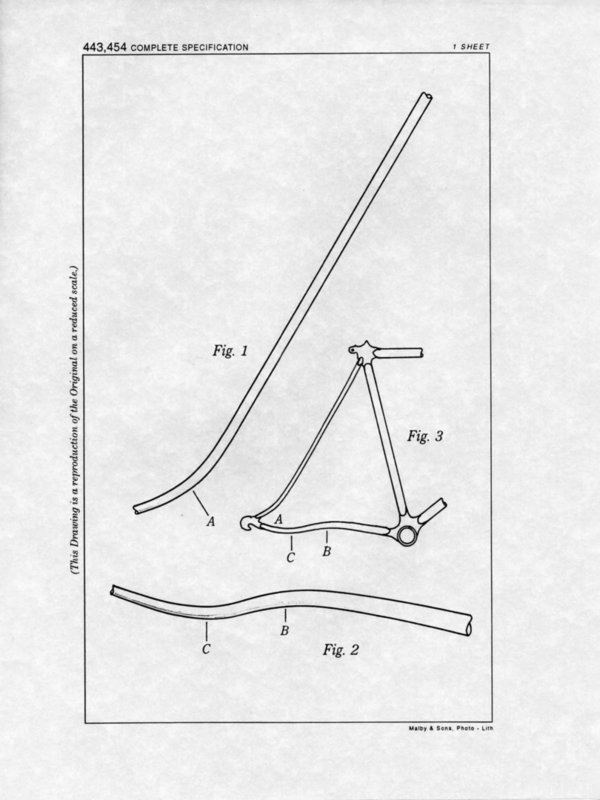 Another such patent application failed after time: according to Hetchins.org, ‘Hetchin’s universal rear fork end,’ provided a forward opening for single or multiple gears plus a rear opening for track racing. 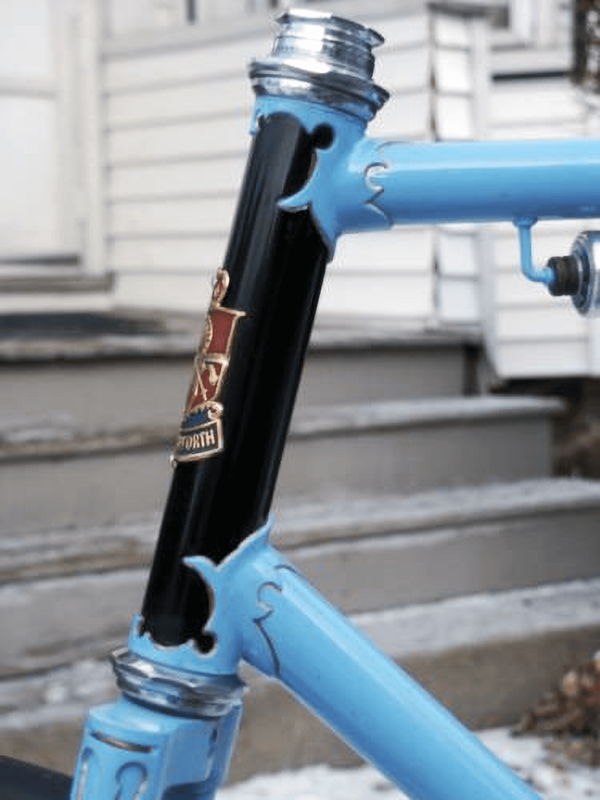 Most notable about Hetchins frames and forks are their lugs, which look more like pieces of art than objects of function, but serve both purposes wonderfully well. In fact, the intricate patterns found in their lugs added to their overall strength and utility. Hetchins cut and drilled their lugs, preventing the need for excessive occurrences of re-heating, which weakens thin-tube cro-moly and steel. 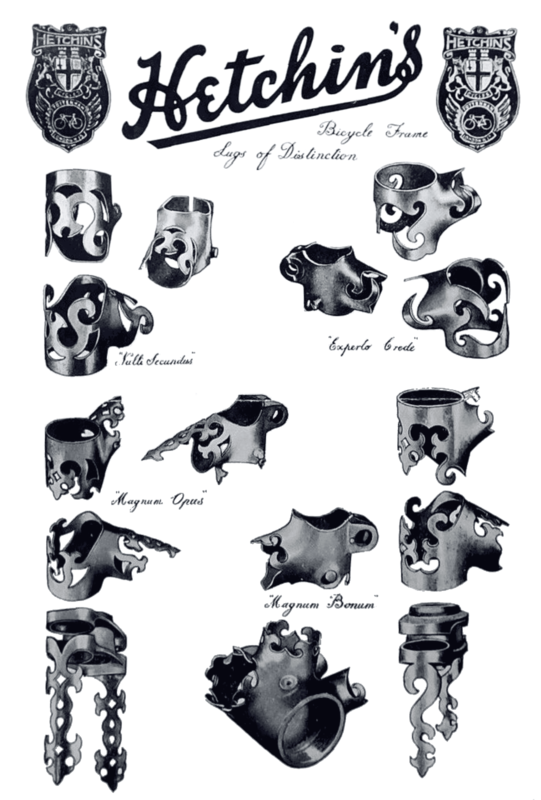 Examples of ornate Hetchins lugs can be found online in abundance. The Magnum Opus II features the most sought-after lug design of all Hetchins bicycles, as seen here. 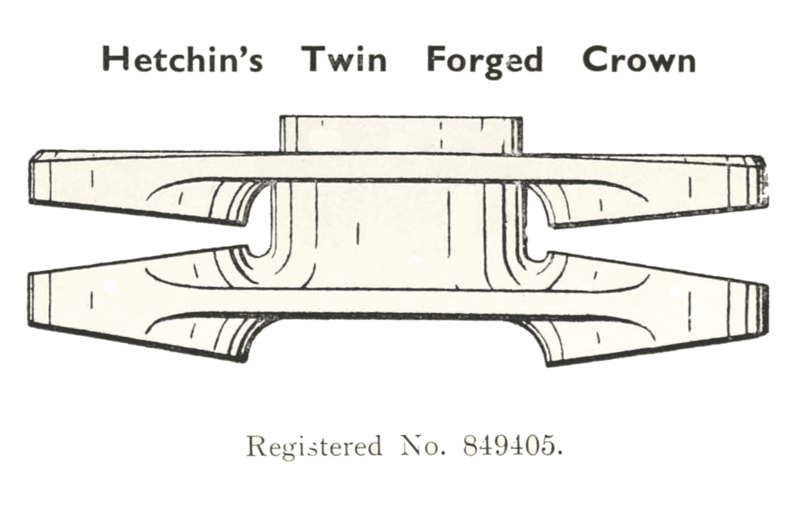 This, the Twin Fork Crown (Registered [Patent] No 849405) was itself distinctive, but as the more ornamental lug designs were developed, [so] embellishments were added to the fork blades below the crown. Again, it was decoration with a strengthening function. source Denny also used tangs on his fork blades to add a touch of ornate class, as well as strength and rigidity, with most – if not all – of the designs and shapes based on the fleur-de-lis pattern that Denny (and others like Ken Janes) so enjoyed. As the War hit Europe full force, most businesses suffered and many went under altogether. But Hetchins didn’t begin any sort of decline in business until the rapid inundation of automobiles in Europe. 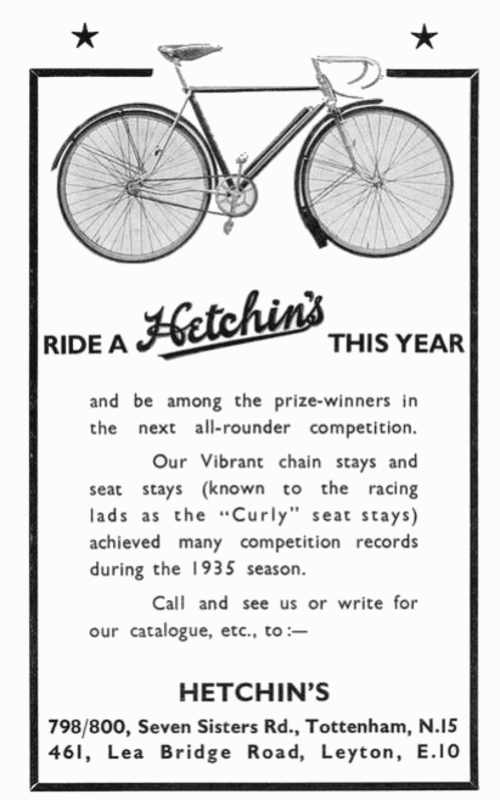 Sales were crippled slightly, but Hetchins bicycles still remained popular enough to keep the business relatively strong through otherwise extremely lean years. By the 1950’s, Denny had designed and named several different types of tangs and most Hetchins models featured them. Around that same time, Reynolds began fabricating fluted and reinforced seat tubes specifically for Hetchins models, which were used on the model 12 (also called the Six Day Model). Hetchins racing successes didn’t seem to be negatively affected by the War much at all, except for the obvious grief and hardship that permeated everything for some time afterward. Cyclists rode Hetchins to victories at the Tour of Britain, the Empire Games, the Circuit of Britain and countless local and national contests during the War years. Europeans had found a gem in Hetchins and while other companies were floundering or selling their popular names to wealthier investors, Hetchins carried on. But in 1961, Hyman Hetchin died and the need for a rapid transition of leadership arose. Luckily, this was both feasible and smooth, as Hyman’s son Alf – a constant presence in the Hetchins factory throughout much of its existence – took over the helm. Jack Denny stayed on as the chief designer and much like the rest of Hetchins history, his presence coupled with that of a now-junior Hetchin led the company to still greater successes, both financially and production-wise. The company faced hardships in other areas, however. Many or even most component companies floundered after the War, making it necessary to find other ways to address the market’s desire for complete bicycles. 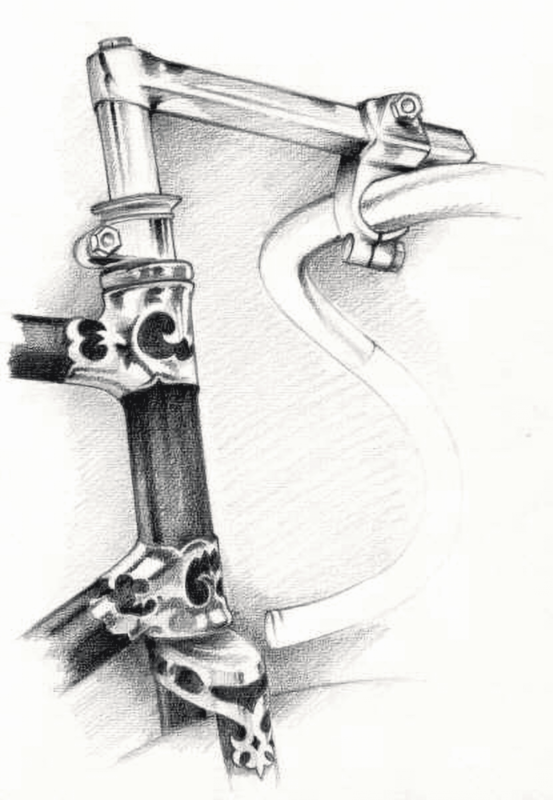 In addition to component challenges, pre-fabricated lugs became widely available around that time, allowing competitors to build frames that were cheaper but still had ornate lugs resembling or at least competing with Hetchins lugs. 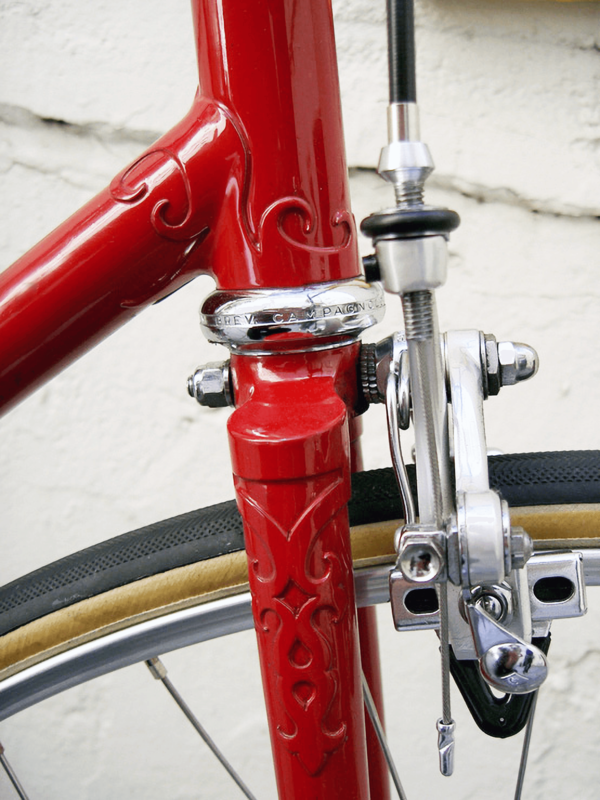 Denny continued to design his own lugs despite these cheaper alternatives, adding to the unique nature of his cycles and further enhancing the market’s desire for authentic Hetchins frames and forks. Designs did become a bit simpler over time, as was the case with the Keyhole model – such as the early-1970s model seen here. New models continued to hit the market, such as the Gothic, Mountain King, Bonum Super and – on the more current end of the 1970s spectrum – the lovely Swallow and its slightly fancier sistren, the Spyder. 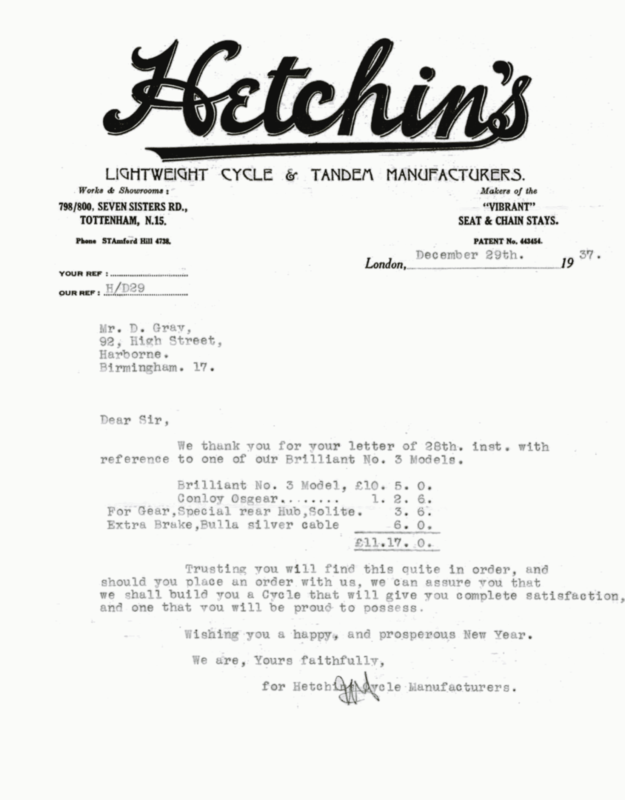 In order to keep the mystique and popularity of Hetchins bicycles alive and well, the company began to export framesets, particularly to the United States. 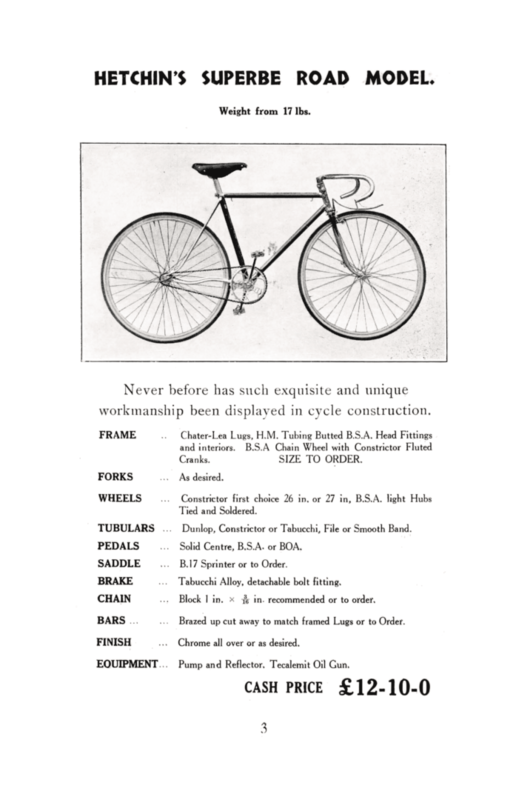 All framesets were hand-made, one-off productions made to standard geometry, or less-often custom geometry, and the framesets quickly became highly desirable in the appearance-conscious American market. According to Hetchins.org, this practice began in 1945 but didn’t become very popular until much later. Earliest on, it was typical to export fifty to sixty framesets each year. 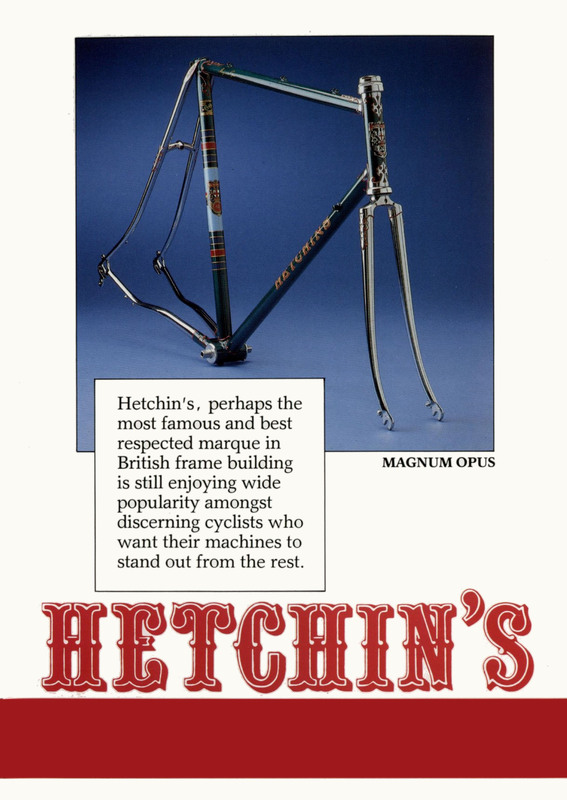 Later, in the 1980s up until the present day, all Hetchins bicycles and framesets were custom-made to the customer’s specifications and desires. Collectors went wild, and even today, Hetchins remains one of the most collected bicycles available anywhere. Despite Hetchins continued success throughout the years, the aging Alf decided to sell the business since, without children, there was no obvious successor. This occurred shortly after Alf began sub-contracting frame construction to Bob Jackson in Leeds. After the company was sold, Hetchin and Denny continued to oversee production of the frames at Jackson’s. But as all good things must end, Denny died in 1991, taking a piece of the Hetchins legacy and character with him. Alf then died in 1996, ending the family-based lineage associated with the company while cementing it forever in the annals of bicycle time. The company still exists today and produces approximately twelve frames per year. They had been distributed in the United States by New York’s World Class Cycles but now appear to be distributed by David Miller world wide. There are several notable models, such as the Magnum Opus, Scorpion Bonum, the thirties model Brilliant and the Anglo Continental. 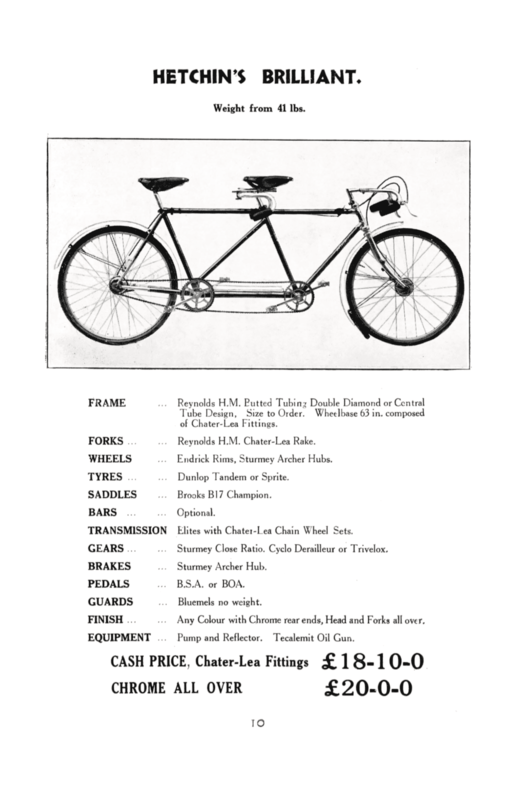 Equally beautiful and ever-popular to collectors is the Brilliant Tandem. Each model features lugs unparalleled in detail and craftsmanship, and many feature Jack Denny’s custom tangs that are always sure to turn heads. Since Hetchins are a favorite of collectors, there has been no shortage of copycats and faked Hetchins. 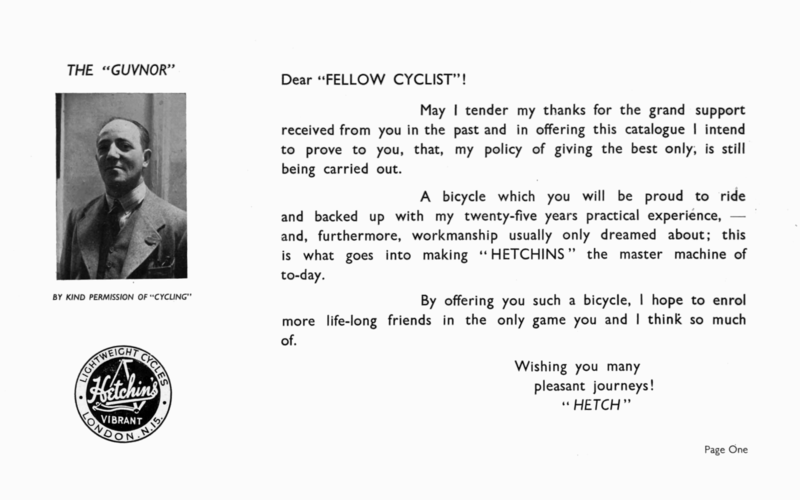 In fact, the Hetchins slogan was, “Copied by Some, Equaled by None” for several years (at one point, their slogan changed to “Don’t Hitch a Ride, Ride a Hetchins!”). 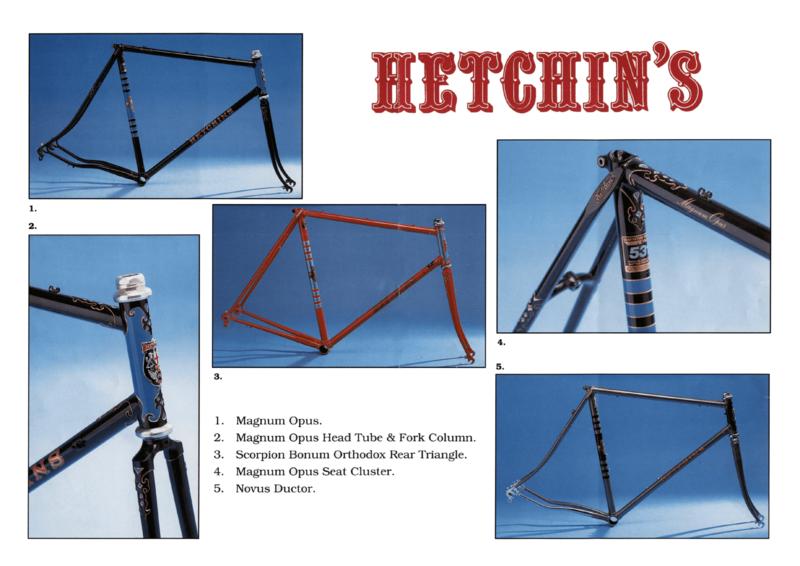 According to Hetchins.org, the most copied model is the Magnum Opus II curly. A surefire way to spot a fake is in the curls: because Hetchins made an exclusive deal with Reynolds to make the curls, an imposter Hetchins will undoubtedly have an inaccurate curve. Other fakes, however, may be harder to spot, such as this one, made by Harry Butler and put up for sale under the guise of an original 1950’s Magnum Opus. Another fake, believed to be made by Butler, can be seen here. The bicycle industry is and has always been a fickle one. A profitable business was historically one that had a strong racing program and the most current innovations and designs; all the others had to fight just to survive in a competitive marketplace. 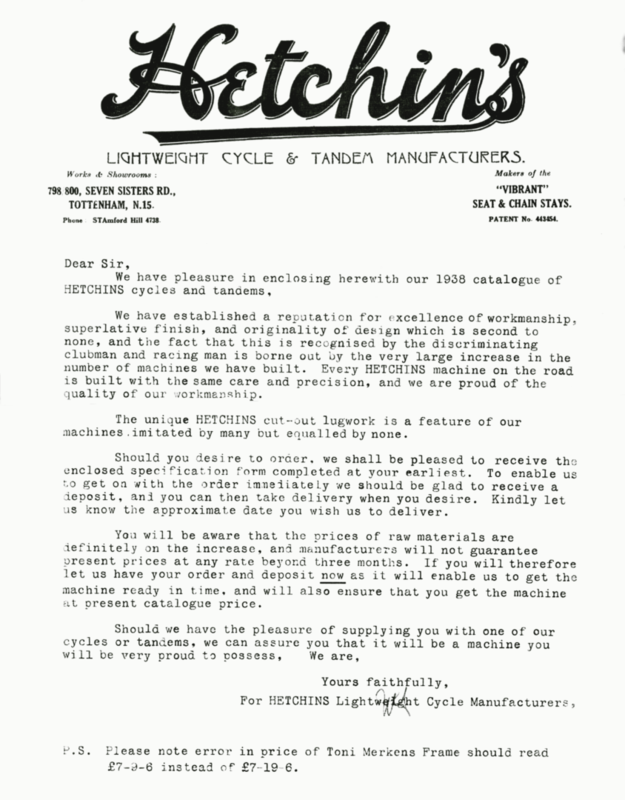 Though Hetchins bicycles performed admirably on the race circuit, they thrived more on workmanship and class grounded by a strong partnership and smart advertising. Instead of fighting to stay alive in the marketplace, they helped define – or even elevate – it. Instead of succumbing to the heyday of the automobile, Hetchins simply continued to produce and refine a classy product the public desired. Though companies today may have more technology invested in their bicycles, virtually none can outclass the charm and meticulous craftsmanship of a Hetchins. Excellent article! Well written and informative. I found your article (written in 2005 but which I have only just come across !) to be fascinating. It told me things that even I,Alf Hetchin’s son,didnt know so I would like to say a belated well done. There is one aspect of the article that is factually damaging and totally incorrect…. and the claim that financial difficulties forced him to sell the business is absolutely nonsense and totally untrue. For a number of years my Dad used to muse “One day I wouldnt mind selling up”…..as a family we would smile at this in the same way we would had he have said “One day I would like to play football for Spurs”..his favourite football team. The reality was that my Father had absolutely no real intention of selling the business and when,out of the blue,Jake Rivera,the manager of the singer Elvis Costello called in to order a frame and then followed it with an offer for the business my Dad reacted impulsively,it was a good offer and neither me,my bother or sister were going to takeover the business,so after a few days thought and with encouragement from us he agreed to sell. Had Jake not made an offer my Dad would happily have continued running it. My Dad was a lovely man and amazingly modest.Everyone who met him liked him. He would have loved your article but would have resented an allegation which was totally without foundation. I therefore would request that not withstanding the fact that the article was published four years ago that you issue a retraction. Need info on a track bicycle I discover from a yard and this name and Japanese character is found on the bicycle. I was told that it is bridgestone can’t find on the net.